I began Fifty, not Frumpy as a Facebook page on July 16, 2011. 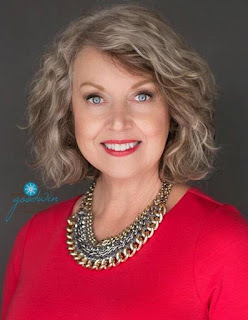 It was a fun way to share my passion for style and my attempts to create outfits which are appropriate for those of us who are enjoying our second fifty years of life. When I started this blog I had recently lost more than forty pounds and was in the process of buying a new wardrobe when I discovered it isn't as easy or as much fun as you might think. We may run and workout or diet endlessly but the fact is our bodies are now shaped differently. Our more rounded curves and softer coloring require that we put a little more thought into our wardrobe choices. We may still dress like our daughters, but we need to make some adjustments so that our choices flatter us and remain appropriate. I share all the tips I have learned along the way, in hopes that it will help you find a style that serves you well. To read more about how I lost weight and kept it off for the past five years click on the Live Well tab above. You may contact me by email at Susan@FiftynotFrumpy.com for inquiries. I no longer accept products in exchange for a review. Love your style!! I'm forty-six, and LOVE the inspiration you are giving me!! Hello! I'm Ann from Canada and I just recently discovered your blog. I am 55 and although I was slim for most of my life, I now have a more curvy body and it's been difficult to dress for that. I take your advice very seriously and love that I now have a chance to reinvent myself and my look. I greatly admire your elegant style and aspire to copy you! Thank you very much for your inspiring lessons. Oh dear, oh dear My Dear you're beautiful!! ! Hello ! Call me stupid but when I try to type your URL on my sidebar, it stays on a post from a year ago. Do you have a new one ? If you hit refresh on your browser settings you should be able to visit the most recent post. Your browser is caching the post that you first visited. I will be 58 Oct. 31 and I need glasses! Any suggestions? Also I have lost 177 lbs over the last 7 yrs so I am very interested in fashion. Now I am still not slim like you but will be one day. Please do u have suggestions for do or don't purchase for glasses. Hi Ken and Bren! I recommend glasses that are square if you have a round face (for example). Google 'eye glasses shapes for your face shap'. You will find several examples with diagrams. Great job on the weight loss! Love your blog! I started following you a couple of months ago and you have given me such inspiration! I'm 78 years old and I really enjoy trying to look good every day. Since I started reading your blog, I've found new ways to put things together that I would never have considered! Thanks so much! I'm 53 and I've been feeling so frumpy lately. I understand completely what you mean be the frustration of shopping in stores for clothes. Clothes are either for teens, 20 something, or look older than I want to look. I broke my ankle just before Christmas. It was hard for me to move myself around and I realized I did need to lose weight. I've lost 20 pounds since January. I'm off my feet again with foot surgery, but I'm still watching what I eat. I have a question about your mostly vegetarian diet. What do you do it get enough protein?